Many leaders still spend most of their time in the office, but the most important part of their role – creating organizational change – requires face-to-face contact with those outside their department (from my Marketing Week column). I’m writing this column from home. Five years ago, we converted the top floor of our house into an office. It’s the place where I design keynotes and write invoices. However, most of the time I’m out and about speaking at conferences, nudging business leaders to speed up their firms’ transformations. Broadly speaking, I cut my working week into ‘tap time’ (one-to-one influencing), ‘prep time’ (writing) and ‘crap time’ (invoices, email admin). In a good week, I get to 80% tap time. In a bad week, it’s 10%. Given I’m rarely at home, that office is probably a waste of space – well, I’m in the business of change, and I can’t make change happen from my desk. More leaders than ever want workplace flexibility, but the current debate is misguided. Don’t get me wrong: I love family time. But work flexibility in a central job like marketing shouldn’t foremost be about working from home or not. It should be about working in the right places. And most of the time, that right place is neither the desk nor the home; it is face-to-face with customers and colleagues, to influence their behaviour. It has never been less appealing to go to the office. Especially in the clogged-up centres of London, Paris or New York, it is a pain. The commute is long, and who wants to be seen with a Southern Trains Annual Gold Card? Firms, especially in the Anglo-Saxon world, have now reduced offices to lines of desks, as if executives were egg-laying cage hens. All of this is to increase so-called ‘collaboration’ (or to bring down office costs – you choose the reason). No matter how many football tables the new CEO puts in, most offices aren’t exactly fun places to work in. At the same time, executives want more flexibility – to look after their family, to pursue other interests, or simply to escape the office craze. WeWork and co can’t find property fast enough to meet demand. And it’s hard to buy a cappuccino without having to stare at armies of MacBook nomads, typing into their machines next to the barista. In reality, firms struggle to make working at home ‘work’. In 2017, IBM sent a shockwave through its global teams; once a model for ‘telecommuting’ (IBM = ‘I’m by myself’), the firm’s new CEO Ginni Rometty completely reversed the model. People had 30 days to join offices again in Atlanta, Austin, Boston, New York or San Francisco, or leave the company. Yahoo, Aetna, and others made similar moves. Granted, these tech firms’ models of remote working were extremes – allowing people to work from wherever, whenever. But in each case, the CEO explanation read similarly: the need for more innovation and collaboration. Here’s the paradox: most leaders are mandated to come to the office but then spend most of their day on prep time and crap time, instead of doing what matters most, tap time: innovating, collaborating and influencing. That’s lots of office space and family time wasted. Over the past couple of years, I’ve visited hundreds of marketing offices. The picture was similar throughout: people sitting next to one another tied to their screen, busy emailing colleagues and doing plenty of administrative work. Those absent were in internal marketing meetings. Marketing, it seems, happens inside the marketing silo. Along the same lines, a recent study confirmed that just half of employees’ work hours in large US companies are spent on productive activities. Influential leaders can’t really spend much time at their desks. In 2017, Patrick Barwise and I published one of the most read McKinsey Quarterly leadership articles. 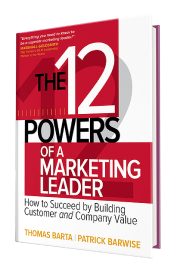 Based on our extensive research for our book, The 12 Powers of a Marketing Leader, the article proves that mobilising bosses and colleagues are among the most important things leaders can do for success. That’s especially true for marketers. Just think about the day-to-day marketing issues. The product needs changing? Talk to product development. Prices are eroding? Contact sales. Service issues? Talk to after-sales. Need a bigger budget? Here’s the CFO’s number. Want to accelerate this launch? Meet the production team. Update the logo? See the CEO (then, meet everybody and their brother). Want a better customer experience? Get in touch with the people creating it today (basically, everybody in the company). Of course, some tasks, like running online campaigns or data-mining, could be easily done from anywhere in the world. But for the bulk of the work, marketers have to engage directly with customers or with colleagues. The 12 Powers research clearly confirms that marketers who leave their desk and walk the halls to make business priorities happen have more business and career success. In marketing and sales, what counts is spending time influencing customers – outside and inside. No desk needed. The push for more workplace flexibility is great. Let’s use the opportunity to give marketers more freedom while increasing their impact. The condition? Marketers must be crystal clear about where they need to be for influence. And that may be neither at home nor at the office desk. The number one priority for every marketer is to influence customers and colleagues, to generate profitable revenue. Ideally, that’s 80% of work time. This work usually requires no desk. This is mostly tap time, which happens out and about, with customers or with colleagues. Then there’s crap time – the glorious joys of writing expense reports and scheduling meetings. Often unavoidable. Again, no office desk is needed. Home, beach, train; you choose. That leaves the marketing office for the important collaborative prep time: innovating new products, designing powerful campaigns, sharing important customer insights and strategising how to win in the market. These marketing offices wouldn’t be like egg farms. They would be creative meeting spaces where the marketing team pulls together. If marketers got their workplace priorities right, they would end up more powerful – and they would see their families more too. Want to lure the world’s best talent into marketing? We need to step up the profession’s standing first (from my Marketing Week column). Dear chief marketing officers, the marketing brand isn’t doing well. Latest news: you are losing market share in a key target group – talent. A survey by Marketing Week and Unidays earlier this year found that only 2% of UK students believe a marketing degree will lead to the best career for them. And don’t bother turning around, there’s no profession behind you that’s rated lower. In a competitive market, at 2% a brand would normally be taken off the shelf. Unfortunately, your other target group, the C-suite, isn’t going to save you. Over half of all board members don’t believe marketing drives revenue. The CEOs of Coke, Hyatt, and Tyson Foods have already replaced their top marketers with chief growth officers or chief commercial officers. And in the US, CMO tenure is nearing its all-time low. So who does that leave in your corner? You guessed it, your agencies. At no marketing conference in this world will you publicly hear about these issues. Instead, at agency-funded parties, the industry celebrates its (former) glory. And with tech firm cash joining the crowd, more champagne than ever fills the glasses on this particular sinking ship. Marketing’s reputation may be on the line, but marketers still have big budgets to spend. Want a top up? If marketing were a brand, you would fire the CMO. The marketing profession needs an urgent relaunch; a relaunch that will revitalise the profession’s standing both inside the C-suite and with talent. And, like all turnarounds, this relaunch will require top marketers to make painful decisions. Marketing needs a much higher aspiration – the aspiration to be the central function. The function that steers the firm’s strategy based on customer needs. The function that shapes the top revenue- and profit-driving programmes. The CEO’s right hand. This higher aspiration for marketing isn’t new – it’s what management thinker Peter Drucker demanded all along. It’s also logical. If marketers could truly deliver profitable growth, CEOs would ignore the naysayers. They would hire top marketers and give them exalted positions. The problem is that too many marketers busy themselves with stuff that doesn’t drive the bottom line. Fun fact: Marketing Week’s survey asked kids what marketers do and 40% said they work with media and celebrities. To the horror of many C-suite executives, that’s what many marketers find attractive, too. To become the central function, the CEO’s goal of profitable revenue must become the undisputed marketing goal. Every top marketer needs a clear perspective on the company’s strategy (not brand strategy) based on industry trends, financial performance, value creation, technology, shareholder expectations, etc. CMOs know what customers want now. That makes a clever CMO a powerful sparring partner for the CEO. The door is wide open. Aiming higher will also catapult more marketers to the firm’s top role. Each year, The Marketing Academy, McKinsey and I work with a selected group of CMOs on their way to CEO. Our research says it loud and clear: leader profiles of top CMOs and CEOs are very similar. If top marketers do their job well, the step to CEO is a small one indeed. Top talent aims high. Today, just 13% of students say marketing will help them on their way to CEO, according to Marketing Week’s research. A stronger C-suite standing will ultimately give marketers more ammunition in the war for talent. Despite all the academic buzz, marketing is an applied science. You can’t learn all marketing at a university. But you can’t ‘just do it’, either. Influencing customer behaviour is complicated. The best marketers know the proven principles, have hands-on experience, and know how to lead. Unfortunately, the marketing profession fails to build rounded leaders. Instead, it produces MBA marketers and GaryVaynerchuk-style marketers, and neither will lift the profession’s standing. MBA marketers spend years soaking up granular marketing skills. Joining a company often produces culture shock. In real life, people don’t always seem to care for the best answer. All of a sudden, it’s about convincing stakeholders. About fighting for resources. About quick fixes. My research with Patrick Barwise for our book The 12 Powers of a Marketing Leader shows technical marketing skills matter. But it’s leadership skills that explain over 50% of marketers’ success. Yet, universities keep producing marketing eggheads instead of business leaders. The Vaynerchuk-style marketer presents a different problem. After hearing that training is irrelevant, the marketer – equipped with mostly tactical social media skills – joins a firm, often in a support role like content management. As these marketers climb the ranks, they need to increasingly wing it as they go along. It’s hard to set prices if you’ve never done a conjoint analysis. Vaynerchuk-style marketers also overestimate their skills’ long-term value. The Financial Times found that, yes, employers value social media skills (that drive revenue). But once social media matures, these skills will fall back into the category that employers today put among the least important: ‘specialised marketing skills’. Just imagine if we trained doctors as we train marketers. That is, we either just teach them theory, or we don’t require any training as long as they are talented in, say, giving injections. You would probably say, ‘That’s a crazy thought.’ After all, great doctors both adhere to proven standards and use their experience to treat patients. Why, then, are sloppy training standards OK in marketing, a firm’s most important function? The role that often determines company survival? The leaders of the marketing profession need to formulate a completely new training approach – an integrated marketing education, combining rigorous university teaching with on-the-job training. This way, students learn the key principles, gain experience, and bring reality back into the classroom – just like doctors do. Here’s my wish: I’d love for 10 world-leading CMOs to get together with 10 world-leading marketing universities to shape a new marketing curriculum. One that will match the rigour and standards of medical training. One that would produce CMO role models with high aspirations. One that would bring about the sea change required to make marketing a talent magnet again. Marketers want a positive, do-good brand purpose but if they do harm before doing good, all integrity will be lost and brand purpose will go straight out the window (from my Marketing Week column). When Ms T entered Auckland’s LynnMall Shopping Centre, beauty products weren’t on her list. At 82, she cared about her looks but she wouldn’t go overboard on creams and gels. A few hours and a few thousand dollars later, all had changed. New Zealand journalists revealed how staff at the Dead Sea Spa shop had bullied her into purchasing bags full of overpriced cosmetics. The mall owner later banned the company from all its centres. But some years on in airports and malls, sales staff of some cosmetic brands continue to coerce people into buying overpriced pots of cream. By the time you have read this article, thousands of customers will be bullied, misled or badly advised by firms whose marketers talk brand purpose. Marketers dream of working for brands that do good by serving a higher purpose, which is great, but this ideal isn’t new. Every marketer in the 1980s who read Stephen Covey’s ‘The 7 Habits of Highly Effective People’ asked themselves, “what’s a good purpose for my life?”. In fact, most leaders I know want their work to be meaningful (a privilege some just can’t afford). But doing good sets a high bar. At the core (level zero), all brands have a simple purpose: to survive. Next, at level one, we expect brands to do no harm. And in a dream scenario, which is level two, brands do even more by doing good and making the world better. But here’s the issue: many marketers dream of level two, get hired for level zero and forget about level one. A decade ago, ailing Nokia axed tens of thousands of jobs. Luckily, most of their traumatised marketers quickly landed a new job. But it was a different story for the 850 factory workers in Salo, Finland, the 2,200 in Cluj, Romania, and the 2,300 in Bochum, Germany. Their job losses deeply affected their families and in some cases still do. Blackberry, Bhs, Clinton Cards, House of Fraser, Kodak, Toys ‘R’ Us: when brands fall out of touch with customers, jobs are on the line – jobs that courageous customer experts could have saved by challenging the C-suite to listen to customers. 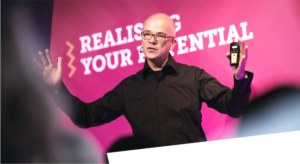 Are you brave enough to step up internally and prevent your brand from becoming the next Nokia? If you want more brand purpose, that is worth the fight. Behavioural science marketing books (in plain English, ‘how to trick customers’) are in huge demand. Around the world, armies of otherwise purpose-talking marketers explore people’s ‘irrationality’ or naivety, to make them buy more, give up rights, or choose the worse deal. Using the term ‘breakfast cereal’ for high-sugar cookies? It’s what kids want. Hidden charges? Read the small print. Giving travellers the option to pay in their own currency with their credit cards for a hefty fee? People want the familiar. Sneaking newsletter sign-up tick-boxes into order forms? Ahem… Cancelling flights and denying rebooking on other airlines? Eurowings still hasn’t replied to my request. The list is endless. I sometimes wonder why Google’s famous ‘don’t be evil’ clause in its code of conduct didn’t make it into the corporate guidelines of Alphabet, its parent company since 2015. And why, even within Google’s own code, it fell from the preface to somewhere lower down in April. Doing no harm as a brand, it seems, can be tricky. We need more integrity in marketing. Marketers are craving a positive, do-good brand purpose, which is commendable. But before doing good comes doing no harm. And as long as cheating happens, the do good brand purpose debate is cynical. Here’s a question: would you be happy to share all of your marketing techniques with customers? If not, you may have crossed the ‘do no harm’ line already. If you believe in doing good, start by doing no harm. If your brand does harm, step in. That would make for a great purpose. Customers see when purpose is about you and not about them. When Pepsi latched onto the #BlackLivesMatter movement in an ad where Kendall Jenner joined a dancing protest, people were outraged. In reality, most customers would rather watch a 24-hour snooker game than your fabricated corporate purpose ad (nothing wrong with snooker, by the way). Doing good isn’t a marketing thing. It’s not about your CSR report, or the one-off sponsoring of whatever is hot in the world of purpose. It’s about the entire business model and how your firm serves society. Just imagine: the most powerful person at the head of one of the most powerful companies in the world, committed to issues like sustainable agricultural raw materials or fair pay. And yet, progress is painfully slow and Polman consistently has to defend his purpose agenda. The brutal truth is that in large publicly listed firms (with short-term profit expectations), doing good can be hard to pull off no matter what the CSR booklet tells you. If you want to change people’s lives from the comfort of your warm corporate cubical, you may need way more courage, tenacity and stubbornness than you think. The alternative? Leave the comfort and benefits of your Fortune 500 firm and get your hands dirty in a smaller shop. Hugh Pile, a former senior L’Oréal marketer, now leads his family’s smaller fresh fruit business, which leaves much of the value creation inside the producing countries. Would he go back to the big brands? Nope. If truly serving society, with all its consequences, isn’t for you, chill out. Helping your million-dollar brand survive, and do no harm, is better than nothing. Agencies, like brands, need consistency. Agencies used to have access to the C-suite within brands but that’s no longer the case. It’s time for agency leaders to step up and rebuild agency C-suite relevance again (from my Marketing Week column). David Ogilvy’s Ogilvy on Advertisingis still among the world’s most respected marketing books. When I started out as a brand manager, Ogilvy & Mather’s office leader gave it to me in a little ceremony when I met with the agency. As he handed it over I was told: “We want to be your closest ally. But we aren’t here to make fancy advertising – we are here to help you sell.” When I opened the book, a bookmark fell out, reading: “We sell or else – David Ogilvy”. At first, I wasn’t sure about the Ogilvy guys. The book ceremony felt patronising. Who was the client again? But more frustratingly, Ogilvy had our CEO’s ear. The agency’s senior executives would frequently meet with our CEO, review the business and talk strategy – without us. In one instance they torpedoed our packaging redesign. Ogilvy feared our customers wouldn’t find the products anymore (they were perhaps right). On these days we hated them. But more often they were brilliant thought partners. They helped us to stay consistent, to keep a broad perspective and, like David Ogilvy had laid out, to sell. Ogilvy, in our company, enjoyed something today’s agencies can only dream of: respect. Things have changed. How many Fortune 500 CEOs today would be keen to meet with their advertising agencies (unless their spouse has a creative idea)? How many agency executives shape their client’s strategic direction? How many have direct CEO access? The low C-suite respect for ad agencies is a disgrace. With a big splash, Ogilvy has just announced its global rebranding. Everything I’ve seen is beautiful – and deeply worries me. Agency owners: red is now up for grabs. The iconic red Ogilvy background has gone in a favour of a colour you’ll get when you leave an Ogilvy brochure in the sun for two weeks. “About Ogilvy” now reads: “We are one doorway to a creative network re-founded to make brands matter in a complex, noisy, hyper-connected world.” Now close your eyes and try to say that again. But here’s the most worrying message for CEOs: Oglivy is moving away from “we sell or else” to “we change or else”. Seriously? Sorry, Ogilvy, I’m picking on you as my former poster child. You are still an impressive firm. And other agencies aren’t necessarily better. It’s just that I still believe in consistency, clarity – and in selling. And it’s painful to see you don’t anymore. Sir Martin Sorrell, the founder and former CEO of WPP, which owns Ogilvy, recently said agencies are facing the perfect storm, with clients’ pressure to deliver short-term returns, technological disruption and fierce cost-cutting. He’s right. But ad agencies should write the real complaint letter to themselves. Fish rot at the head. The loss of stature and relevance was gradual, and the fault lies with agency leaders (not with the creatives). There’s now the same (if not more) short-term return pressure on agencies. Many ad executives are mainly chasing work – any work. Losing a client is a revenue disaster. As a result, every trainee marketer can put pressure on the agency. Impartial agency advice and dissent from the client’s view have become the exception. Technological disruption, for agencies, should be marvellous. Company leaders, more than ever, need partners with a big-picture strategic perspective. But in today’s ad agency world, thought leaders are rare. C-suite-level thought leadership isn’t something people are born with. Yet few agencies train their staff to develop that thinking. Instead, to be cool, agencies have joined the tactical digital hype. To not lose out, many have sucked up tech-boutiques. When Procter & Gamble last year suddenly cut millions of digital ad spending with no revenue impact, the agency world felt caught-out and kept a low profile. Thought leadership? Look elsewhere. There was a time when agency and company CEOs met to talk strategy. Today, thousands of agency salespeople pitch nitty-gritty work at marketing departments’ lowest levels. CEOs (and even CMOs) have more important people to meet. And with little C-suite access for agencies, procurement will do what they do best: cut their fees. But that’s not half of it. Some agencies are now more siloed than their worst clients. Many of their leaders worry most about internal issues: How do we organise? How do we integrate? 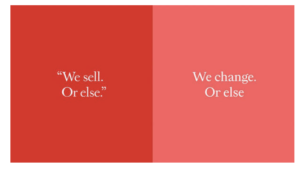 Of the nine messages in Ogilvy’s rebranding brochure, eight are internal. For example, the move from ‘Creative Department’ to ‘Creative Network’. Influential design expert Armin Vit wrote in his Ogilvy redesign review about ad agencies: “I don’t find them remotely as interesting as they find themselves”. What’s the ‘value creation zone’? It’s time for agency leaders to step up and rebuild agency C-suite relevance again. Every CEO wants to sell. Every C-suite leader wants to hear from people who know how to sell. The C-suite door, for real thought leaders, is wide open. Some weeks ago, I led a thought leadership seminar for agency executives. When I asked “What’s your most strategic client priority?” people said things like “online advocacy”, “in-store journeys”, “brand purpose renewal”. All nice and good, but nothing any CEO would want to meet about. To matter at the top, an agency must work inside the ‘value creation zone’ – the zone where customer needs and company/CEO needs overlap. That’s why every client team should have a perspective on issues like the risks and opportunities for the client’s business model. For a car maker, for example, that’s currently not customer experience but issues like electricity versus gasoline, car ownership, autonomous driving. How could the company sell more and better things to more people at a profit? Operationally, how could the company become faster, more efficient? Within just one day, the executives in our seminar developed a much broader perspective on their clients’ businesses and how their agency could really help (enough to seriously impress the CEO who came to the final presentation). Just imagine all ad agencies would consistently aim for that CEO discussion. Agency stature, pride, and success would rise. That dialogue would transform an entire industry – for the better. Only one thing will never change: you sell, or else. Facebook’s current data woes point to a bigger challenge: leaders must stop delegating responsibility and take charge of marketing communication again (from my Marketing Week column). Communication could be marketer’s most powerful tool. But it’s complicated. Facebook is plagued by questions about its data policies and how ads on its platforms have influenced voters (including in the US election and Brexit). YouTube ads appear next to hate speech. Millions of dollars get lost in agencies’ shady media deals. Many social media metrics remind me of La La Land (P&G cut millions of social advertising dollars without negative sales effect). TV ads appear when the wrong audience is watching. The list of issues won’t fit this column. It’s perhaps no coincidence that many CEOs believe marketing communication is a mess. Many marketers are asking themselves: who’s on the hook for all these marcom issues? The answer is you. Marketing communication is complicated – granted. There are tonnes of media channels now. Consumers are changing habits all the time. Technology moves fast: pixels, AI, programmatic; you name them. When it’s about complexity, many marketers choose the simple way out: delegating everything to agencies. Selecting the right media? The agency does it. Allocating the budget? The agency should tell us how. And when things go wrong? It’s the agency’s fault. Don’t get me wrong, agencies are marketers’ lifelines. Many do amazing work. But no matter how many experts you use, you are still in charge. The current Facebook saga is a classic. When news broke that data analytics company Cambridge Analytica had acquired millions of Facebook users’ data, marketers – mostly behind closed doors – were angry. “That’s unacceptable,” they said. Many turned to their agencies to demand all sorts of guarantees that the scandal wouldn’t hit their brands. If data were a drug, marketers would be the cartel bosses – not Facebook. It’s the marketers who choose the medium, agree the budget and approve the booking. By the way, if you believe your work is complicated, you aren’t alone. Ask your doctor, your IT colleague, or your CEO – you’ll hardly find anyone who isn’t wrestling with a gazillion new tools and technologies. Complexity is a fact of modern life. The leadership question is how to handle complexity. The answer has two parts: first, keeping full ownership, no matter how complex things become; second, constant quality control. In a world where you can’t do everything yourself, and where you delegate tasks, you must put checks and balances in place. It’s the only way to stay on top of things. Every marketer knows that message beats medium. The most sophisticated media plan won’t heal a broken message. A colleague of mine has recently proven how AI models can improve the success of a creative execution, but he says most marketers don’t bother with this level of detail. Yet, if your ad isn’t compelling, forget media planning; your cash will be wasted, no matter what. Full ownership: As a marketer, you must own the customer insights, the actual message, top-quality agency briefs, the ad’s effectiveness, your research methodologies. Delegation with quality-control: Your agencies will typically take up things like the ad creation, the research fieldwork, etc. How can you check the work’s quality? Because that’s your job too. Full ownership: It’s for marketers to own the actual media mix and the factors behind it (the ratios, spend levels, audiences, etc). To get this right, you must also fully understand TV, radio, print, outdoor, Facebook and so on – their benefits and their downsides. Let’s get back to Facebook as a case in point. The Cambridge Analytica case was, for the most part, perfectly legal. Facebook’s ‘friends permission’ function explicitly allowed developers access to profiles of users and their friends. That’s how an app, developed by Cambridge University’s Aleksandr Kogan and used by 270,000 people, produced data on millions of users. There was no hack. Cambridge Analytica acquired that data from Kogan – according to Facebook, against its rules. Do other people ignore Facebook rules? I leave it to you to judge (hint: yes). Facebook isn’t in any way special. It’s a media channel. Marketers who use it must be on top of its risks and benefits. Delegation with quality-control: You’ll typically find yourself giving media mix analyses, media planning and media booking to external partners. But all of these really do need quality control. Take media agency contracts: how is your agency paying media owners, what are the commissions and kickbacks? That’s very (very) difficult to find out. But we are talking five-, six-, seven-figure budgets. Quality control is your job. Here’s an issue low down on marketers’ priority list: where is your ad actually being shown? Recently I saw a striking analysis: ad effectiveness could sometimes be doubled by choosing magazines or TV programmes with highest involvement for your important customers. Won’t the media agency ensure perfect campaign fit? Let’s think. Media agencies often have bulk contracts with media owners. To hit agreed volumes, they need to shuffle a certain amount of business into a channel. Do they care about your objectives? Absolutely. Do they always act in your best interest? Again, it’s for you to judge. Full ownership: You must know the effect of people’s involvement with TV programmes, magazines and other media on involvement with your commercials. It’s a detail with big implications. Perhaps you find the level of ownership and checking I propose excessive, unrealistic, too much work. I disagree. Think about this: 77% of marketers are in charge of communication, versus 56% in charge of product, and 32% of pricing. If marketers don’t fully own their most important field – communication – what should they own?